As part of the CRSS- SaferWorld- OESP project Beyond Boundaries Phase III, a Pak-Afghan track II series of dialogues and outreach efforts, during the visit of the Pakistan Afghanistan Joint Committee (PAJC) to Kabul as part of the university interaction planned for the group, two to three members each from the PAJC visited the Kardan University. 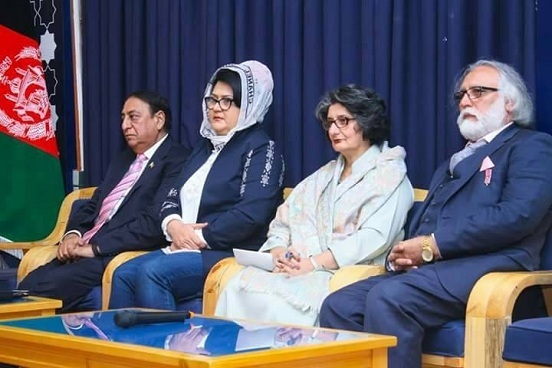 The Pakistani speakers were Mr. Rana Afzal Khan, Member of National Assembly, Mr. Toaha Qureshi MBE, International Expert and Chair, and Ms. Seema Baloch, former Ambassador, while, the Afghan speakers included Advisor to Afghan CEO Mr. Mozammil Shinwari, and Ms. Elay Ershad, Member of Parliament. The Beyond Boundaries PAJC memebrs were welcome by the Director of Kardan research Centre. More than fifty students, male and female, and some university faculty members attended the session. Speaking first from the Afghan side, Muzammil Shinwari set the scene with briefing the audience on the project, the partnership of CRSS and OESP through Beyond Boundaries III track 1.5/II dialogue, its need and outcomes. Rana Afzal Khan, speaking from the Pakistan side, expressed his gratitude that the Afghan people, the institutions like Kardan University and the government officials have welcomed the delegation with such warmth. He also explained that the peace and stability in Afghanistan is as important as it is for Pakistan, and it can only come through sincere efforts by both countries. We are brothers and can resolve our differences by sitting around the table. We must accept where there is a problem and have the will to find a lasting solution. Afghanistan is a sovereign country and we do not wish to interfere in its matters in any shape or form. Toaha Qureshi MBE reminded the academics and the students that they were an asset and future for the region and not only for Afghanistan, therefore, they needed to get themselves released from the historical/past baggage and support such initiatives for dialogue. As a British observer, Mr. Qureshi asked the audience to remember the magnitude of hostility and animosity between France, Germany, Britain, etc. was in such stage that they ended up having two world wars and lost millions of people. In spite of all that these countries have managed to form a European Union, EU market, Euro as currency and NATO – the myopic view of hatred and hostility was set aside for the greater good of future generations. This unity has brought about the establishment of internationally recognised human rights, peace, strong political systems and economic stability in the region. He said that we need to learn lessons from the European experience of war and peace. Pakistan must not see Afghanistan through Indian prism and must continue to root out all sorts of violence and terrorism, particularly on the Northern borders. The same rule applies to Afghanistan with regards to anti-Pakistan terrorist groups operating from Afghanistan. For the desired outcomes such as long lasting peace and security, both countries must have five kinds of dialogue, 1) P2P= People to People, 2) G2G= Government to Government (politicians), 3) A2A= Army to Army, 4) M2M = Media to Media, and 5) B2B= Business to Business. Ms. Seema Baloch, former Ambassador, put very useful question to the students rather than giving a speech. It transpired that many of the people either were born in Pakistan had studied in Pakistan or their parents had lived in Pakistan as refugees. Elay Arshad, Member of Afghan Parliament, said that terrorism is an issue that both countries face and have to deal with. She said such dialogues and interaction with youth is very important as it creates opportunities for people-to-people contact and improves awareness and perceptions on Pak-Afghan relations. The members’ speeches were followed by an inter-active question & answer session with the students. The students were very much open with regards to anti-Pakistan sentiments as they allegedly believed that groups such as Haqqani network are being supported by Pakistan to destabilise Afghanistan. Their questions were answered in a very constructive manner, and the air was cleared by all the delegates. A university survey was also administered with the participating students and faculty members – post the lectures by PAJC members – to gauge the improvement in their perceptions on the other side; understanding of the challenges of Pak-Afghan relations, and awareness about the socio-political conditions in both countries.